However you slice it, strawberries are a great way to start your day. You can be sure I keep my refrigerator stocked come strawberry season. Here in California the harvest is most abundant in the Spring, but with all the greenhouses I can get them almost year-round. 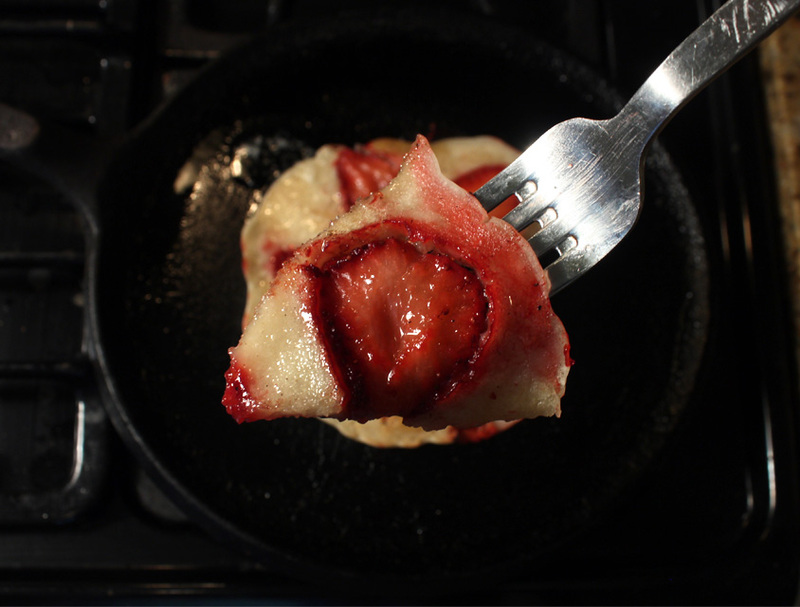 If you like like them too, then you've come to the right place for a delish video recipe: Strawberry Pancakes. If you can get them from a farmers market, or roadside fruit stand, you are indeed fortunate. 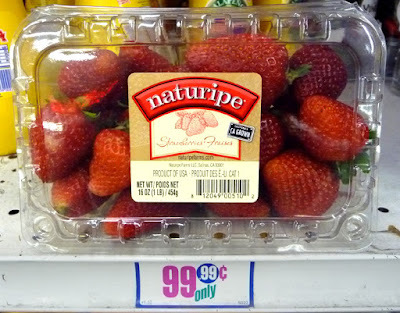 But even from regular grocery store fruit bins they are sweet and flavorful enough. I get mine from my local Latin market and 99c only Stores, usually in clear plastic 1 pound containers. I use store-bought dry pancake batter mix that I find at 99c only Stores. 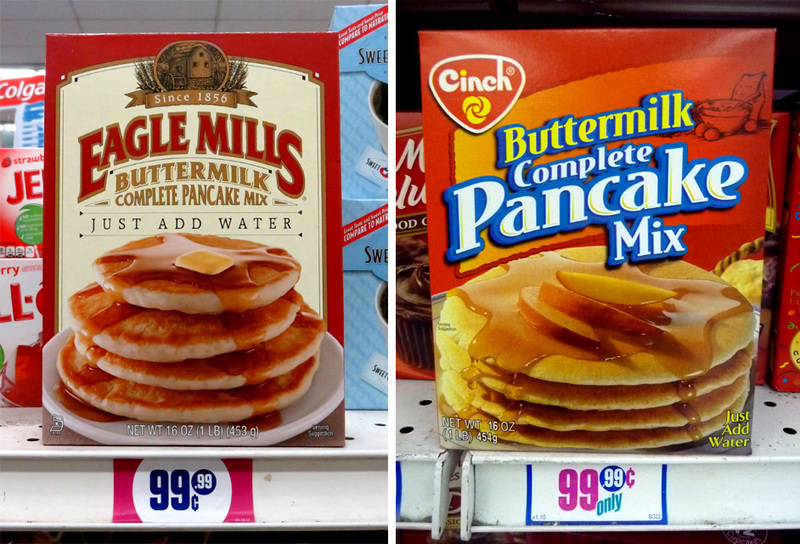 You can use any favorite pancake batter. Strawberries are very delicate. Be sure to turn the containers all around to inspect strawberries for ripeness and a uniform red color. Sometimes they are not fully ripe or even too ripe. And the fruity pancakes are so simple to make, just trim off the leafy green strawberry caps and slice the juicy fruit; mix up a store bought pancake batter; and fire up the stove top griddle (frying pan). I like to add the strawberries to the frying pan first then pour on the batter. That way the berries come in direct contact with the hottest part of the pan. The strawberries soften and slightly caramelize to extra sweetness. 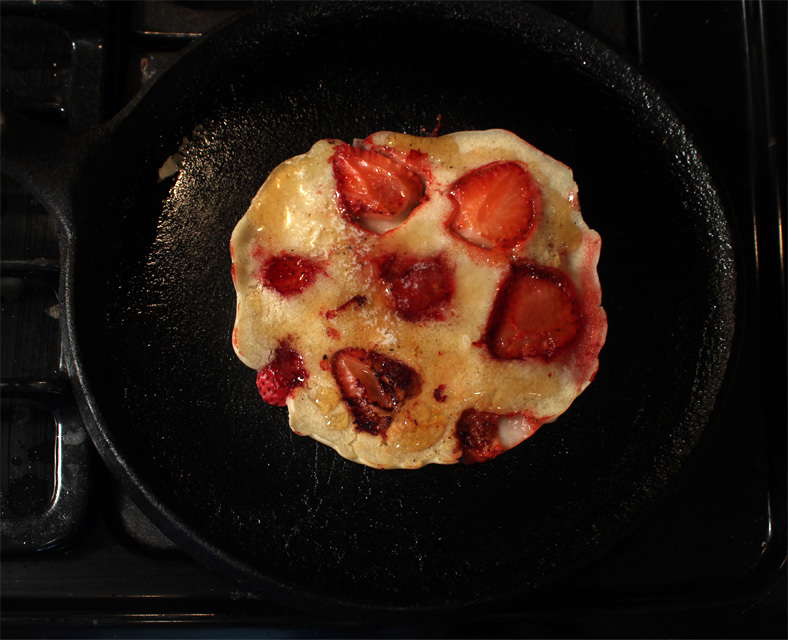 If you like your strawberries less cooked then just mix them into the pancake batter. I enjoy fresh strawberries in my morning cereal, mixed into yogurt, and now sliced in pancakes. Play it here. The video runs 1 minute, 7 seconds. 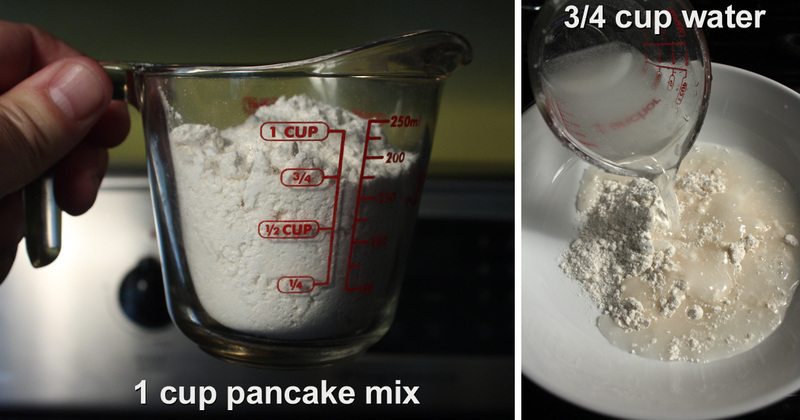 1 cup pancake mix - following store-bought pancake mix directions. Okay to use vegan pancake mix too. 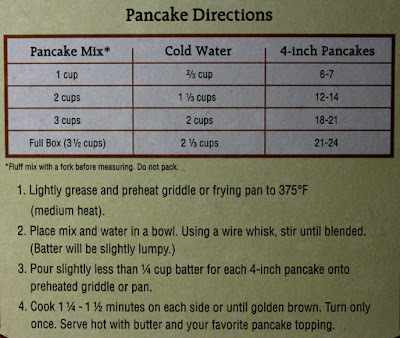 3/4 cup water - following store-bought pancake mix directions. 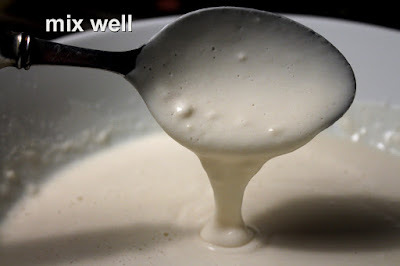 Okay to use milk for a richer pancake batter. 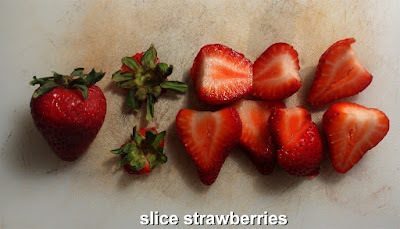 1 cup strawberries - roughly sliced or chopped. Use any strawberry amount that suits your taste. Okay to substitute with any fresh seasonal fruit like: cherry, blueberry, peach, apricot, strawberry, and even sliced banana (watch when cooking as bananas burn easily), or canned fruit like pineapple and peaches. 1 tablespoon of cooking oil - to grease skillet. 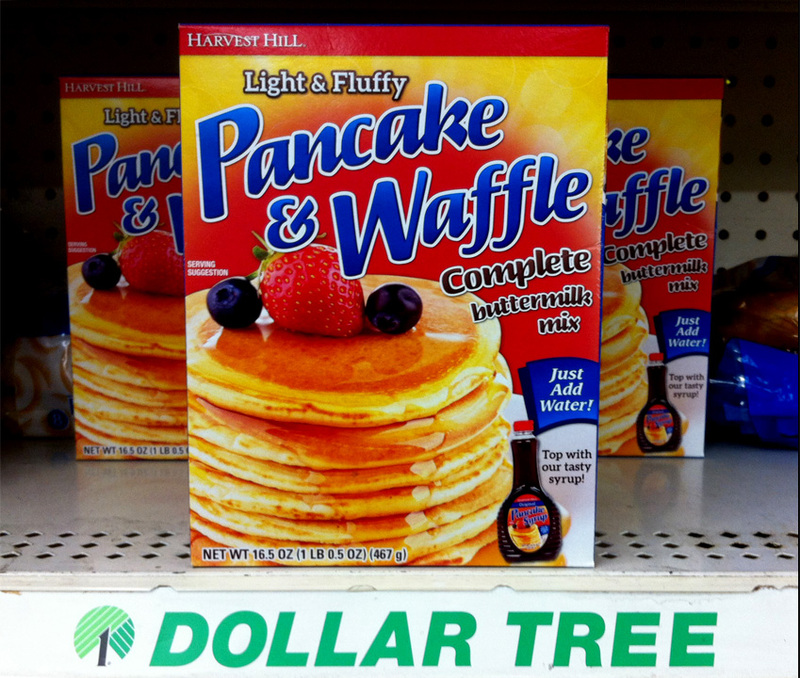 Add more when needed, depending how may pancakes you make. Butter and favorite pancake syrup - add as much as you like. Okay to use butter substitute. Start to heat the pan over a medium heat. Slice or roughly chop strawberries. Add oil to pancake pan. 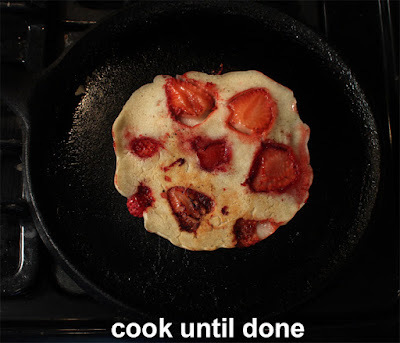 I like to add strawberries first so they caramelize when cooking, but okay to just mix strawberries into pancake batter. 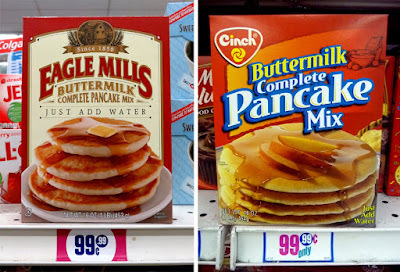 Pour on the pancake batter. Brown each side of the pancake. Mine took about 2-3 minutes for each side. It really depends how hot your pan gets. 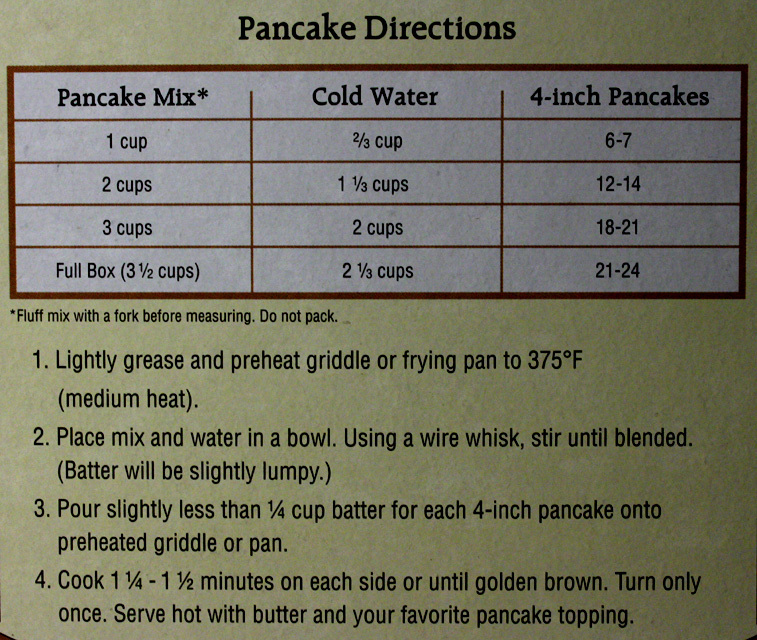 The box directions above mentions cooking time to brown each side as 1.5 minutes each....hmmmm, they must be using a super hot pan! Serve hot with melted butter and your favorite pancake syrup or topping.